Tulsa. Dallas. Jenks. Sand Springs. San Antonio. Even Saint Petersburg, Russia. And of course, Sapulpa, Oklahoma. This screenshot shows our visits for the last 30 days and where our visitors are coming from. We use this information to make informed decisions about our coverage and partnership opportunities. These are the locations from which our readers are flocking to our stories over the last 30 days. While some of these locations make a lot of sense, and others leave us scratching our head (“why did Dallas account for 14% of our traffic last month?”), the point remains. Sapulpa Times is growing. Spreading. Adapting, and growing some more. It’s not by accident, by the way. There are lots of ways for an online news site like ours to gain a following. Not all of them are equal, and depending on the audience, not all of them will be successful. Our latest channel for getting our stories to those who are looking for them is that we’re now being indexed by Google News. 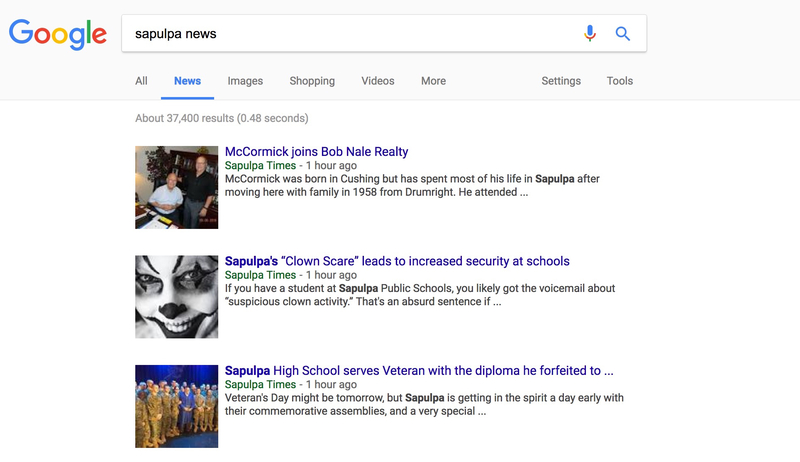 Now, when you search Google for Sapulpa-related topics, simply click over to the News tab of your search results and if we’ve published a story on it, chances are, it’ll be there. Usually it’ll be the top story, or two or three. The foundation of our scrappy little startup is (and always will be) “Telling the stories of the people and events in the town that we love.” That’s the message. The method of delivering that message to you however, will continue to evolve as often as the channels for communicating do. Recently, we announced that you could have our stories delivered straight to your iOS device via the Apple News App. By implementing Google News indexing, we’re simply making good on that mantra and providing another method by which we help you get the news you care about. Sapulpa Times can also be found on Facebook, Twitter and Instagram.